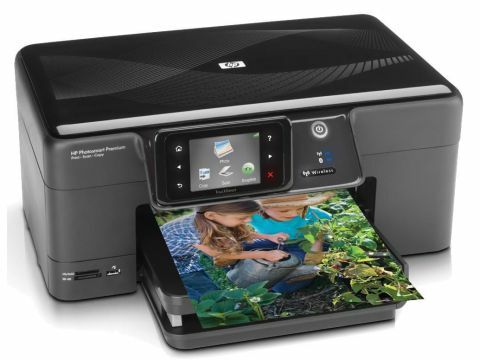 Touchscreen triumph, wireless wizard, premium printer, or just a blatant copycat? Makes a lot of unnecessary beeps! HP pretty much invented desktop colour inkjet printing, launching its first DeskJet 500C model onto the market all the way back in 1991. For most of the time since then, HP has stuck rigidly to its dual black and tri-colour cartridge configuration, usually enabling you to swap out the black cartridge for an optional tri-colour 'photo' cartridge, boosting the ink range for six-colour photo printing. A major advantage was that you effectively got a brand new print head with every new cartridge but running costs were typically high. By contrast, the Photosmart Premium C309G takes a leaf straight out of Canon's book, combining a single print head with five ink cartridges, featuring both dye-based and pigment-based black inks, along with cyan, magenta and yellow dye-based inks. For outright print quality, this makes it a direct rival to the Canon MP640. Sleek and compact in its stylish black shell, one of the HP C309G's main claims to fame is its colour touchscreen. This makes standalone functions like making photocopies or scanning directly to a USB drive or memory card supremely intuitive. Even so, at 8.9cm the touchscreen is 2cm smaller on the diagonal than the one featured in the Lexmark Interact S605, and the HP lacks some of the customisation options offered by the Lexmark's downloadable Smart Solutions, but the interface works well nonetheless, with the minimum of fuss and bother. There are some neat touches in the Photo section of the on-screen menu. You can create photo album pages, panoramic prints, wallet photos and passport photos direct from a media card, without needing to fire up your computer. A little more oddly, there's also a direct link to Snapfish, HP's online photo printing service, so you can log onto the site and print photos on your desktop printer that are stored online. It's a bit like online photo printing in reverse. The HP is well-connected, coming complete with USB, Ethernet, Wi-Fi and even Bluetooth interfaces as standard, as well as card reader slots for SD, SDHC, MMC, MS and xD media cards. Unlike the Canon MP640, however, there's no CompactFlash slot, which some photographers may find a bit of a drawback. Print speeds are pretty impressive in normal quality modes, with our tests recording nine seconds, 19 seconds and 27 seconds for A4 mono, A4 colour and 6 x 4-inch photos respectively. Switch to top quality photo mode and things slow down noticeably, but at just under three minutes for a full borderless A4 photo print, the HP isn't exactly a slouch. Running costs are very reasonable and rather more competitive than the Canon MP640 and Epson PX710W models for combined ink and paper costs for photo printing.